Cleveland’s dad took him duck hunting and he ran off and got sprayed by a skunk. Mom had to bathe him; this now makes his 3rd to remove the stench. Hydrogen peroxide, baking soda, and dish soap works best to get the smell out. I always keep an emergency supply on hand. Good Luck! I’m sorry mom, I won’t do it again, please don’t make me take another bath! That face! That big nose! Adorable. Pitiful, but adorable. Oh, poor handsome Cleveland! Why should you be punished for your awful Dad shooting living creatures?? I know you’re a retriever, but yeah, you can retrieve tennis balls and toys without having to be part of a killing game. Shame on your Dad, and ugh for your Mom! Except he can retrieve ANYTHING. It doesn’t have to be formerly live creatures. This isn’t 100 years past, J. Fail. If Dad got your sprayed then Dad should have to bathe you. Its only fair. 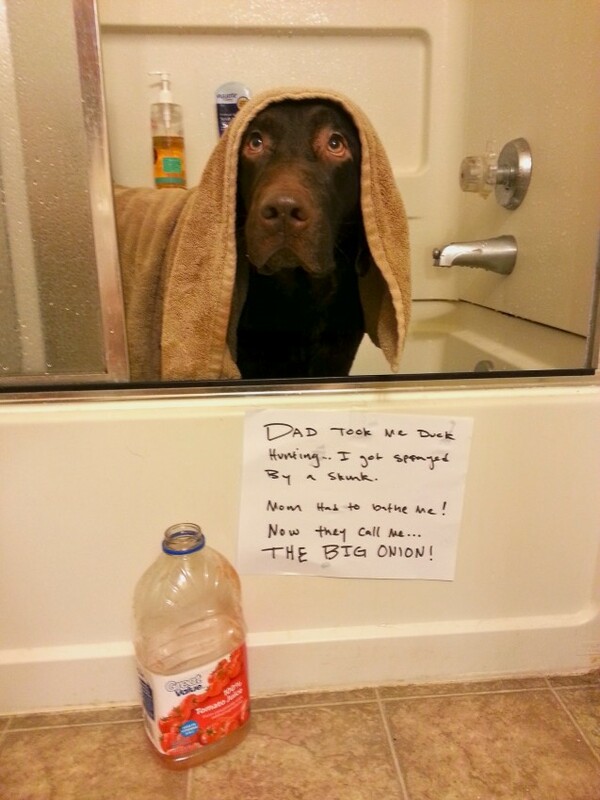 Geez people, he was trying to retrieve the skunk!!! its because the skunk’s spray is oil based and nothing cuts through oil like dawn dish soap….and nothing neutralizes like baking soda 🙂 my dog has an infinity for skunks too lol! What a cutie!! I love the look on his face and the towel over his head! That is my dog’s twin!! Stupid skunk.Adorable Lab….And yes, Labs are a sporting breed…they hunt and RETRIEVE.duh. Is that recipe safe for around the face? That’s where my dogs usually get sprayed. Thanks for the info. When I lived in New Jersey there were an abundance of skunks. Going back many years ago, one of the dogs I had at the time (I miss you, Ace!) got skunked badly when I let him out in the yard for his last constitutional of the night. Of course, it was well after midnight and I had to run out to the 24 hour supermarket (luckily there was one!) and get tomato juice. Took a LOT of large cans before he was resonably not smelly anymore. Fortunately I now live in coastal South Carolina where there aren’t any skunks for my 2 dogs to have to deal with! I love Lab eyes! Mine (chocolate as well) gives me the same look. Melts my heart every. single. time! Hi. You need to use peroxide and baking soda and dawn dish detergent. tomato juice wont really work. skunk stink is an OIL and the more you get it wet, the worse it becomes. The dawn will break the oil, the peroxide and baking soda will work like an enzyme cleanser and actually destroy the stink. put it on and let it sit for as long as doggy will tolerate (DON”T GET NEAR EYES or IN MOUTH) and rinse. do it twoce in a row and you will notice a significant difference. good luck!